Recording information during a quarry visit. New display on novaculite is available. This website serves as an educational resource to broadcast information about novaculite and its historic uses. Novaculite was an important raw material that was quarried from outcrops across the Ouachita Mountains by American Indians as early as 10,000 B.C. It is still used today for manufacturing whetstones and has other commercial uses. A key part of this website is the map showing source counties where quarries have been recorded as archeological sites in western Arkansas, and the distribution counties where novaculite artifacts have been found in and beyond the state’s boundaries. 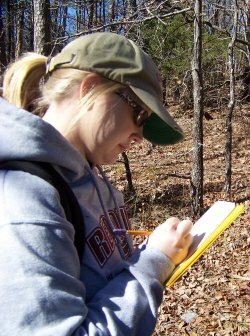 This website can serve as an educational resource for teachers, park interpreters, and museum personnel in Arkansas. Visit the “References and Links” page to find other Arkansas Archeological Survey websites and educational materials about Arkansas archeology. 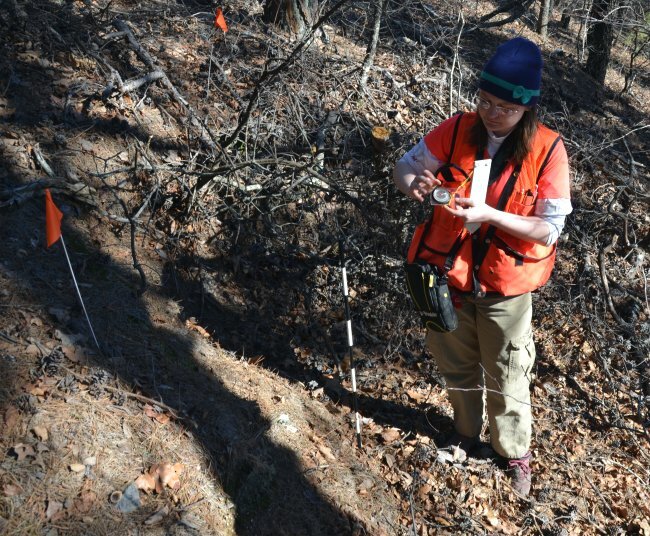 Vanessa Hanvey reads compass direction in a quarry pit at 3GA565. This section of the website features suggested learning exercises that science, math, and social studies teachers and students can use. As part of this website project, an educational flyer on Arkansas Novaculite has been created by the Arkansas Archeological Survey. It can be downloaded here and printed/distributed as needed. A three-fold color brochure is also available. 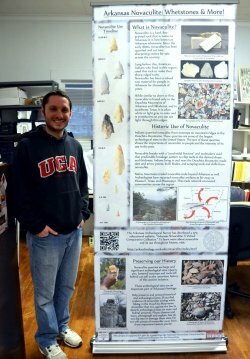 Tyler Stumpf and Mary Beth Trubitt created a “portable educational mural” about Arkansas Novaculite. This is a self-standing banner (8’ tall, 3’ wide, 1’ deep) that can be set up in schools, libraries, museums, visitor centers, or other public venues. To arrange for a loan of this educational display, contact Dr. Trubitt at mtrubit@uark.edu or telephone 870-230-5463. The Arkansas Archeological Survey maintains several websites that explain and explore Arkansas history and archeology. Visit the “Indians of Arkansas” website and the “Rock Art in Arkansas” website. The Survey’s education program has created lots of flyers and brochures about Arkansas archeology. A lesson plan written by Julie Hill, “Arkansas Novaculite: More than a Whetstone,” is available from Butler Center for Arkansas Studies, Little Rock. 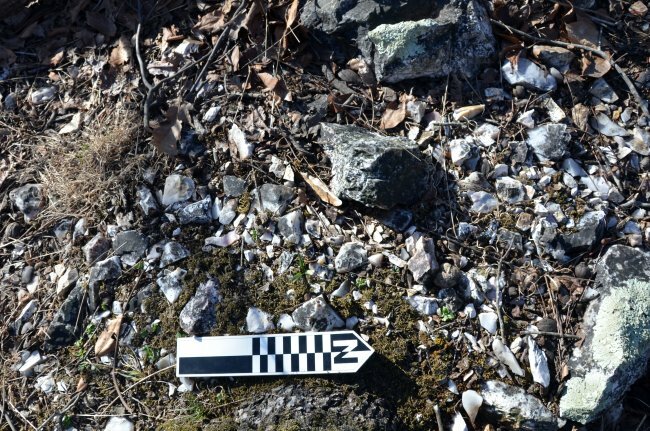 Novaculite debris at quarry 3GA587.